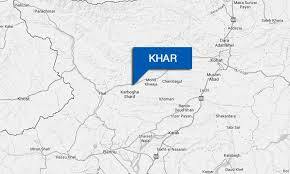 KHAR: On Tuesday, Oct 25, 2016, at least six people, including three personnel of Levies force, were wounded when their vehicle was targeted by a remote controlled improvised explosive device (IED) in the mountainous area of Salarzai tehisl in Bajaur Agency, local people and officials of the local administration told. The officials said that the incident took place in the hilly area of Mulla Said Banda in Salarzai tehisl, some 30 Kilometers east of Khar, the headquarters of Bajaur agency. They said that the vehicle was on way from Salarzai area to Khar when an improvised explosive device (IED), planted by unidentified assailants at a link road in the said locality, went off. Local people said that explosion occurred when the vehicle reached in the area. Following the blast, people of nearby areas and levies personnel reached at the site and took the wounded to agency headquarters hospital in Khar. The victims were identified as Rahimullah, Rasool Khan,Slahuddin, Mujeeb Gul, Bali Khan and Imran Khan. According to official sources, the injured included three personnel of levies force, a polio worker, a driver and a conductor of the vehicle. However, the officials refused to say anything about the activities of injured levies personnel and a polio worker in the said area. “I have no information regarding activities of the injured levies men and a polio worker in the blast area; nonetheless, it’s clear that they were on official duties and coming to Khar from the said locality,” said an official. The blast in Mulla Said Banda area took place four days after the security forces had foiled a terror attack by recovering a huge cache of weapons and explosive devices during a search operation in the region on October 22. Besides the recovered weapons and explosives, two suspected militants were also arrested by security forces during the search operation. Doctors at the agency headquarters hospital told that all the wounded were out of danger. Bajaur Agency political agent Abdul Amir Khattak, accompanied by others officials, visited the hospital and inquired about their health conditions. No militant outfit has claimed responsibility of the attack till filling of this report. The levies force, backed by the members of local peace committee, conducted a search operation to arrest the assailants responsible for the blast; however, no arrests were made till Tuesday evening. Conversely, according to local people, some residents of nearby areas had been arrested under the collective responsibility clause of colonial Frontier Crimes Regulation.